When Indiana University junior Joey Chamness was searching colleges to attend, the Indianapolis native didn't have to look far. Chamness knew he wanted to attend the nationally recognized Kelley School of Business at IU Bloomington to study finance and marketing. His family also has a deep love for IU. "I've been a Hoosier fan since I was born," he said. "My dad, older brother and many more family members are IU graduates, and my grandma still lives in Bloomington. I love it here." 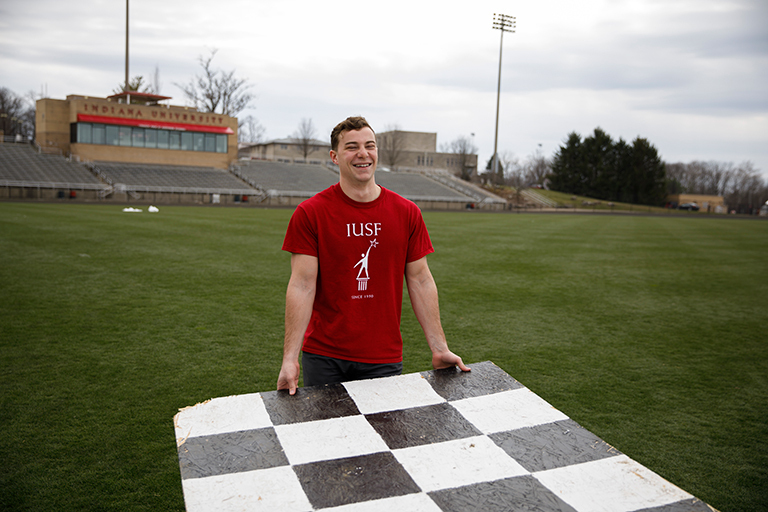 Not only will Chamness join a long line of alumni when he graduates next year, he is also continuing his family's legacy of participating in Little 500, the largest collegiate bicycle race in the U.S. that has become a staple on the IU Bloomington campus. During their time at IU, Chamness' father and brother were both part of the IU Student Foundation steering committee, which puts on the race. His father served on the steering committee in 1985, and his brother served in 2015. He also has an uncle who coaches one of the racing teams and a cousin who rode in the race. His senior year in high school, Chamness attended his first Little 500 race and remembers not only the excitement of the race but also being impressed with his older brother who was working behind the scenes. "I remember hearing him speak at an alumni affairs committee event and I thought 'Wow, this whole steering committee thing is impressive.'" Founded in 1950, the IU Student Foundation now has about 300 members, 25 of whom are chosen as steering committee members. The foundation's biggest event is Little 500. Chamness joined the IU Student Foundation his freshman year, and this year he is competing for a spot on the Little 500 steering committee. Students are allowed to compete for a spot on the committee the second semester of their junior year. These "gunners" work behind the scenes, alongside current steering committee members, to make sure Little 500 goes off without a hitch. Duties include social media and marketing, designing and selling merchandise, organizing track practices, preparing the track for race day, and running timing and scoring on race day. Each gunner must clock 10, two-hour shifts, although many work much more than that. Their hope is to work hard enough to earn a spot on next year's steering committee; they find out who made it on the day after the race. Tory Blackwell, president of this year's steering committee, called Chamness a hard worker who always brings a positive attitude. When asked why he would work so hard to be a part of the committee, Chamness credited his love for the foundation and all that it does. "I joined the Student Foundation because of my dad and brother, but I would have joined anyway," he said. "It allows us to be so hands on, and it provides leadership opportunities you can't find in other organizations. And you get to be a part of Little 500, one of the greatest IU traditions. Even working behind the scenes, we take a lot of pride in being part of the tradition." When he is not participating in foundation events, Chamness is busy organizing "shavee" events for the St. Baldrick's Foundation, which raises money for childhood cancer research. Volunteers shave their heads both to raise money and in solidarity for all of the children who lose their hair fighting cancer. Chamness was diagnosed with bone cancer at the age of 8. He underwent a year of chemotherapy and multiple surgeries that eventually resulted in the removal of 7 inches of his femur. Although there was a possibility Chamness could lose his leg, he was fortunate that chemotherapy shrank the tumor enough for doctors to be able to save his leg. But like most people battling cancer, Chamness ended up losing his hair. Although it was tough to handle at a young age, he had the support of his family, friends and classmates who all shaved their heads in solidarity. "Being a kid, having no hair, it bothers you," he said. "Everyone knows you have cancer because you don't have any hair. I was really fortunate to have a lot of support from my friends and family. When I had to shave my head, my older brother, twin brother and classmates shaved their heads for me. That takes a special person to be willing to do that." Chamness' family began participating in St. Baldrick's -- they still hold events and have raised more than $1 million for the foundation -- and Chamness has since brought the cause to IU. 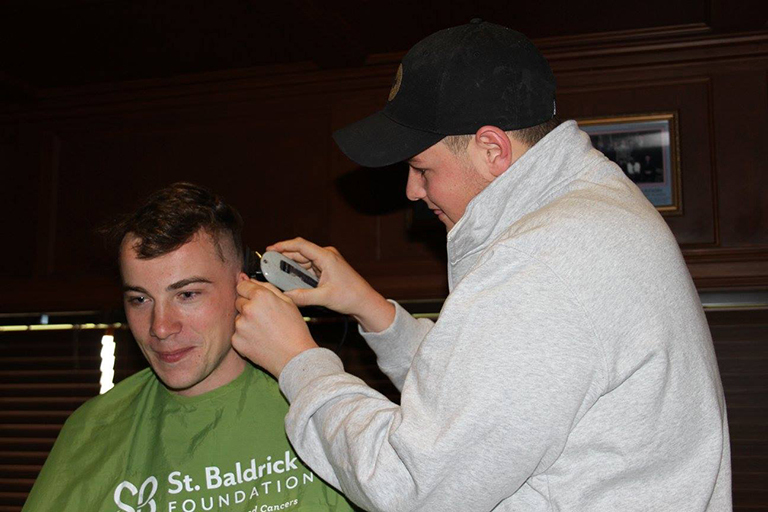 Last year he held a shavee event with his Beta Theta Pi brothers, raising more than $22,000. He is hosting another event April 7. "I recognized I am very lucky," he said. "I was lucky to not have long-lasting side effects, to not have my leg amputated. I had the best possible outcome I could have. I recognize not everyone is as fortunate as me. So, I want to make sure I give back."